Have you ever felt that your life was lacking something? That you needed to give back somehow? Have you ever been to another country and seen how the locals live? Do you love to travel? I have. I do. That is probably why this book spoke to me. It is about a man who, once entering his 40s and having his beloved father die, wonders if something is missing from his life. He wants to have children but his wife is uncertain. At the same time, he wants to give back and to be the man that he saw his father as being, which was a good man and a kind one. He wonders who will remember him and honor him the way that he remembers and honors his father. To find out, he travels to several different places around the world, doing volunteer work for a few weeks at a time. I enjoyed this book. I always enjoy reading about travel and travelogues are one of my favorite genres. This book did not disappoint. It got my interest with some of the stories from abroad and I found my head nodding to some of the descriptions of the countries, the locals, the feeling of helplessness when you can't communicate, as well as the satisfaction of communicating without words at times. 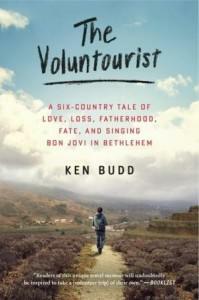 I have done volunteer work abroad and loved it and so this book brought back fond memories for me. The book was split up into 6 sections, which each described one of the author's trips. I felt that it was organized well and was easy to read. I would recommend this book to others. It makes me want to put on my boots and get on the road! I received a complimentary copy of this book from TLC Book Tours in return for an honest review. I was not compensated, nor was I required to write a positive review. Do you like to travel? Have you ever volunteered in a foreign country (or at all)? How was your overall experience?